Today, the ADS Miniature Daffodil List has named cultivars only; there are no species on this list. This is because species daffodils are so variable: some may be miniature in size, and others grown in different conditions may be of standard size. 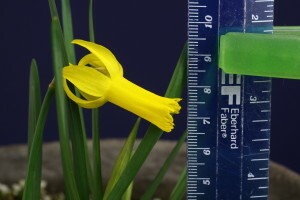 Miniature-size species may be exhibited in ADS Daffodil Show classes for miniatures. Click on “Special Classes” within the upper right box titled “Other Queries”. Check the “Miniature” box under “American Daffodil Society”. Click on the BLUE “Submit Query” button. After the list is displayed, you can click on a specific Miniature daffodil name and read detailed information and view one or more photographs. Or you can output the entire list to a PDF document by clicking on the RED button next to the ‘Select rows/pages’ function area. Please note: this DaffSeek functionality is only available for PC, laptop, or tablet platforms. It has not been implemented for the phone platform.